Over the past decade, school projects have provided AV consultants and integrators with a crash course on IT know-how, as educational facilities at all levels have been a testing ground for distributing and storing AV content via network technology. Network distribution of lectures, seminars, and special events is occurring on campus and beyond, in the case of distance learning applications. Meanwhile, podcasts and other multimedia content are stored on servers for access by students and even the world at large, as more educational institutions perceive shared information as another means of garnering interest among prospective students. 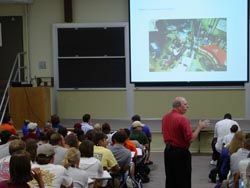 Mississippi State University integrated the Barix Instreamer into existing classroom lectern devices that feature audio mixers, amplifiers, and other devices. Whether streamed or stored, educational content is more often taking the form of audio, video, and data. As this trend continues to develop, the issues of storage capacity, bandwidth, backup, and content rights will come to the fore.The ability to share audio from classroom recordings is a prime generator of interest in expanding network functionality on campuses. First and foremost, demand arises from the fact that students can revisit lecture content anytime and in any place with podcasts. But interest is growing on the "public access" side as well. Universities have "figured out that more people are subscribing, and there is an increase in the number of people interested in studying at a particular university because they can listen to lectures and get the information," observed Johannes Rietschel, CEO and founder of Barix. Networked audio distribution on campuses can also provide another function, one that has been elevated in importance by recent events. Barix has seen an increase in the number of university inquires related to emergency paging since the tragic events at Virginia Tech. The University of Washington standardized on the Barix Instreamer. As capabilities continue to evolve, education clients are more familiar with IP-enabled audio technology, but they still need to be educated on the full potential of audio, video, and instructional media data integration with networks. "What we have talked to educators about is why not offer students a way to enhance their classroom experience," observed Kim Dillard, director of marketing for AMD/MediaPOINTE. By recording video for streaming or storage on a server, students will have "the opportunity to watch the lecture again as a refresher when they are at home." In addition to the option of offloading the lectures onto a central network, AMD/MediaPOINTE's CopyMe! technology allows students to burn the classroom content immediately onto a USB flash drive or CD-ROM following the class. As more and more audio and video content is created in classrooms, storage and backup are critical. Even with the prevalence of compressed audio and video formats, the size of files is increasing as the content increases in resolution.